Compatible with all Windows platforms including Windows 10/8.1/8 etc. After an accidental system shut down, I lost all my data from the tape drive, but Kernel for Tape helped me recover the files accurately. It is helpful and wonderful tool! I lost all my files from the tape drive due to virus attack, but now I am happy as this Kernel for Tape worked like sheer magic. The software was easy to operate, and in just minutes, I was able to get back my lost data. It doesn’t matter, what is the real cause of loss of data, the tool is always effective in restoring the data from tape. Restores tape drive data under situations when it gets accidentally erased, misaligned, damaged, broken or de-spooled from tape drives. 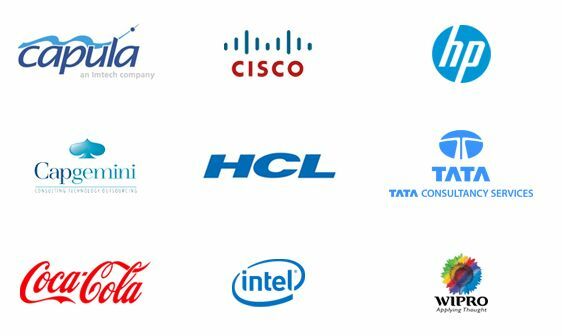 Right from time to time, we keep updating the functionalities of the software to enable user to operate the tool without any hassle. This software is well equipped with Live update feature which timely updates the software with the latest version whenever it is available. The user, operating this tool doesn’t have to be worried about the compatibility issues. The tape data recovery software works equally well in most of the versions of Windows i.e. Windows, 10/8.1/8/7/Vista/XP/2000/98/NT/95 platforms. The tool features interactive GUI environment, that lets you recover data from your lost files and folders with complete ease. 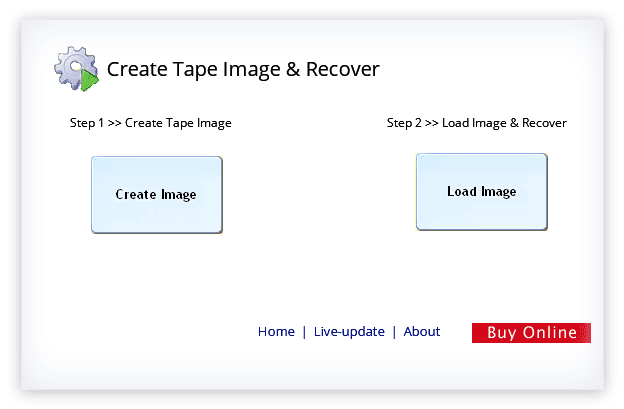 Recovery can be achieved in three simple steps – create/load Tape Image, select the targeted drive for recovery, and save the data. CreateIn this step, to recover the data, you create image of drive by clicking on ‘Create Image’ button. 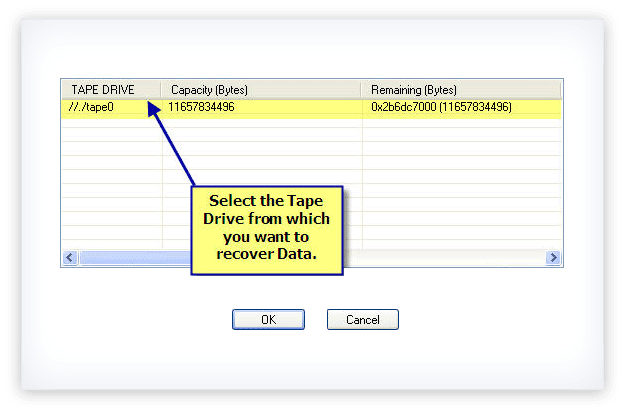 In this step, you can select the drive which you want to recover. 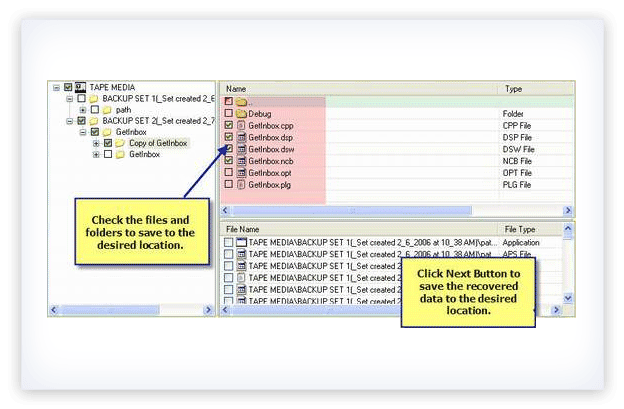 In the final step, you can save the recovered files enlisted in a hierarchical structure. Can you suggest me an effective tool to restore my lost data stored on tape? Data stored on tape are always susceptible to any physical or logical corruption issues. We recommend you to try Kernel for Tape Tool which is professional tape recovery software. Whatever is the reason of tape data corruption, it quickly recovers all inaccessible data from corrupted or damaged tape storage media. How to recover my lost tape data by using Kernel for Tape Tool? 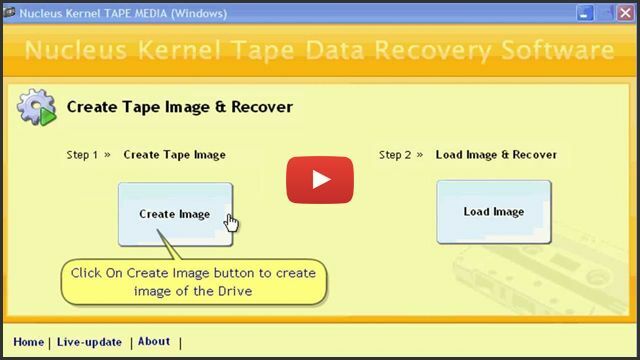 Its very easy to perform tape data recovery operation by using Kernel for tape software. When you launch it, you need to create image of tape drive which leads to “Save as” option for saving tape data to be recovered. Now, it starts scanning and recovers inaccessible data from tape. On the completion of data recovery operation, it displays all the recovered tape data which can be saved at desired location. I am not technically expert in using software and recovering data; so can I use it? Kernel for Tape is much easy to use and user friendly data recovery software. It doesn’t need any technical expertise or external assistance to use it.Self-descriptive interface assists you to just follow step wise given instructions and perform a comprehensive tape data recovery operation in a hassle free environment. Is it possible to try Kernel for tape tool before buying its full paid version? It is easily possible to try this professional tape recovery tool before purchasing its full version. We recommend you to download free trial version of Kernel for Tape and use it in order to evaluate its performance. After being satisfied with its performance, you should purchase its full version so that you can save the recovered tape data. Kernel for Tape recovers all the damaged data from all types of corrupted tape cartridges like DLT, AIT, LTO, and DAT tape formats. Missing and deleted files can be easily recovered with the help of the software. Kernel for Zip recovers files from your corrupted zip folders. These files generally get corrupted due to incomplete downloads, virus attacks or CRC errors. The software supports recovery from zip files which are compressed using WinZip or any other compression utility.